I said my next concept dish would be plantains, so here we are. When I was growing up, we ate beans on Wednesday and Fridays, afternoons only. We ate beans with fish – fresh, fried, smoked…mostly fried. Dodo, fried yam and garri were accompaniments sometimes. Though I loved the beans my mum cooked, I especially loved the one at my aunt’s house. I’m not sure what she did differently but her beans seemed smaller and sweeter, with a deep savouriness I can’t explain. Fast forward to 2016. We’ve gone past me not cooking beans, not on Wednesdays or Fridays or any day for that matter. My friend, N back in 2012 made converts of my own children by offering them some of her finest and voila, bean lovers made. Its interesting that till this day, I avoid eating beans at night. My children don’t care – but in my mind, it could give up a tummy upset so better in the afternoon. I wonder if that’s what my Mama thought. Anyhoo, so yes, I’ve started making beans. Funny thing too, I can only eat stewed beans aka Jollof beans with fish – not with beef, chicken or any other protein! If it isn’t available, I’m happy to have it on its own. I present to you, after my long story – beans & dodo. The concept? 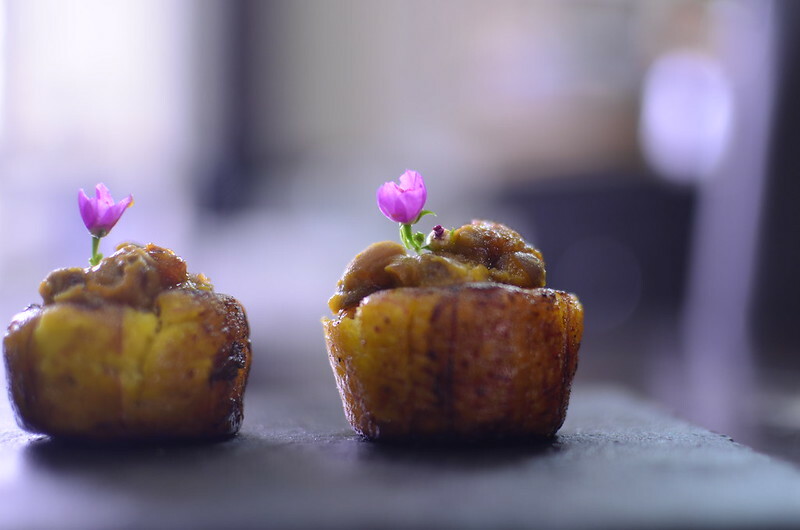 Appetizer cups made of fried plantains, filled with beans and topped with some spicy pepper sauce. How did the idea come? 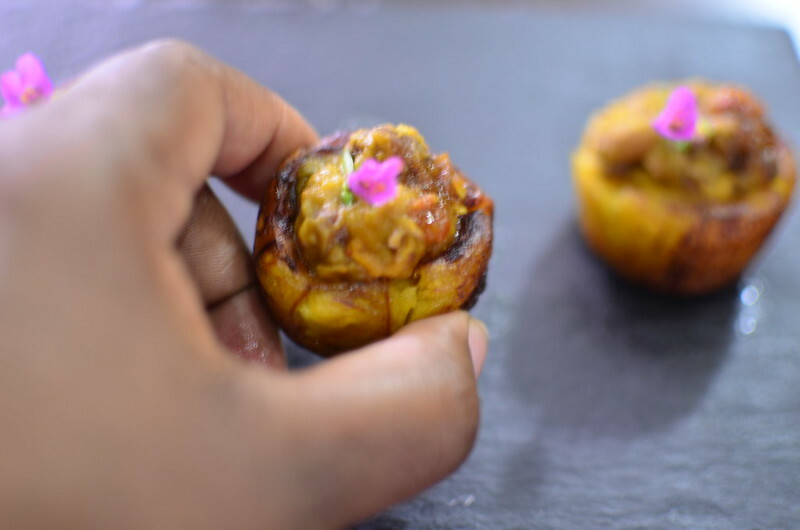 I saw tart shells, and my mind travelled to plantain shells…then I thought about how well it would go with beans. I think these make pretty good canapes – vegan too with only plant-based ingredients. To add a touch of glam and elegance, I contrasted the orange and browns with green and magenta, of waterleaf flowers and buds…which are edible. Yes, Nigerians – they are edible! Full stop!! 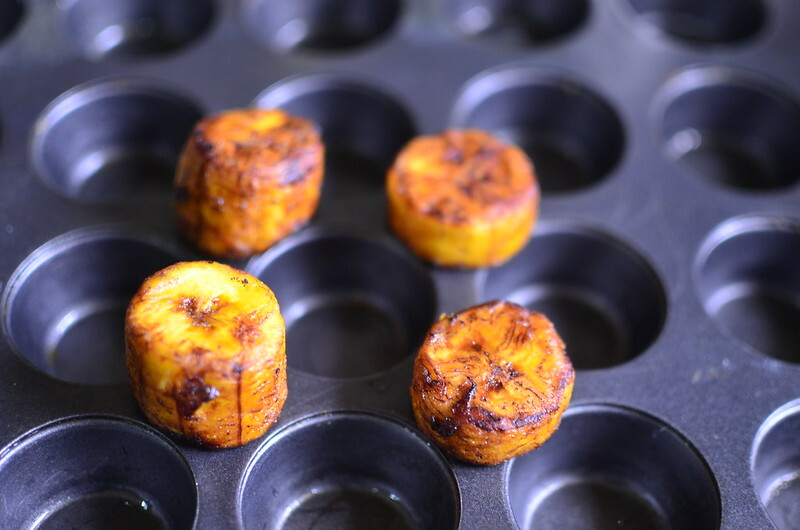 I cut the plantains in rounds along the length. I tested two lengths, one roughly an inch and the other almost double that. I didn’t know which would work better for the ideal cup size – one that contained just enough beans to create a good beans – plantain ratio. 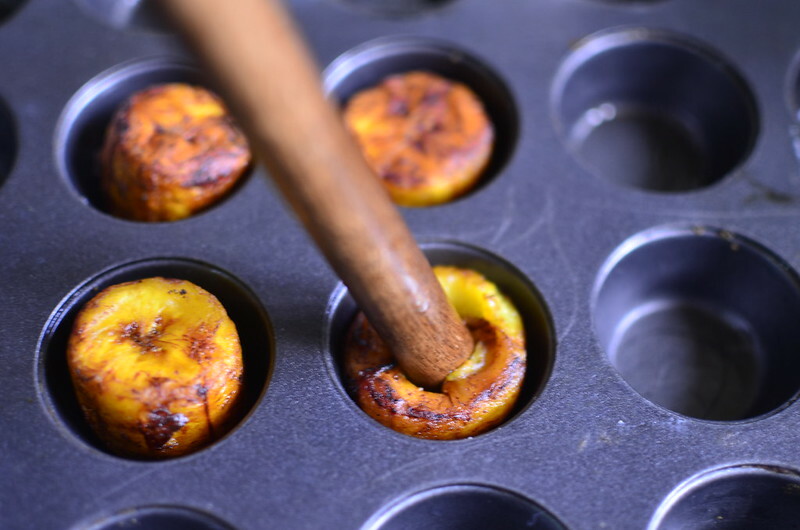 I fried the plantains till golden, drained and left to cool a touch. To create the hollow, I gently pressed down in the centre, using the end of a rounded wooden spoon. Which then got filled with warm beans, topped with pepper sauce and finished with a flourish of magenta. 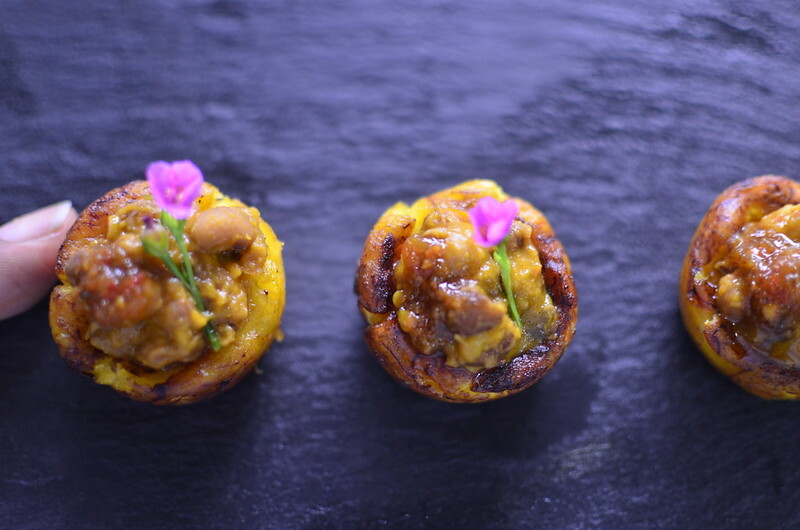 Voila – beans and dodo, canape style. Though I fried the plantains, I think grilled would work, particularly with ripe plantain. 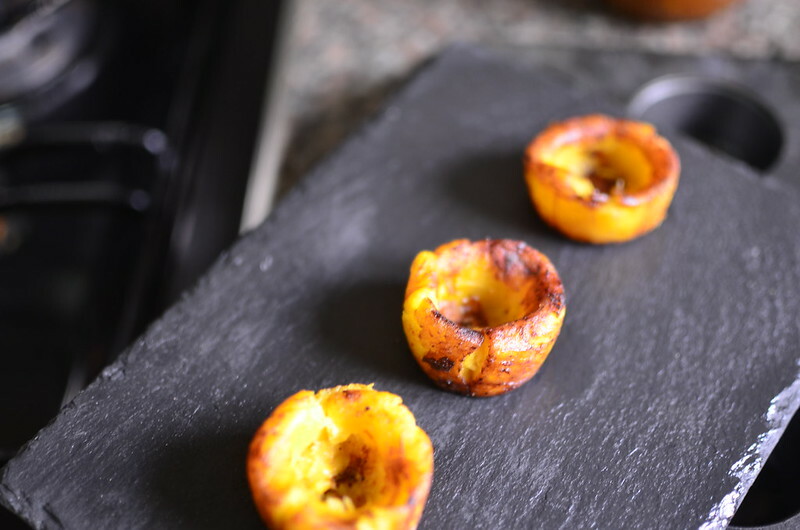 The colour wouldn’t be the same – this gloss of maturity and sweetness which characterises ripe plantains. If you wanted to add some more to it, flaked fish would work, combined with the beans, or tiny edges cut to garnish. In any case, what did I think? It was easier to work with the cups that started out as 2 inch pieces. This creates a sufficient hollow for the beans and anything else you might want to add.